A common species which is most conspicuous in fruit, when its single head produces silky-white cotton-like plumes. 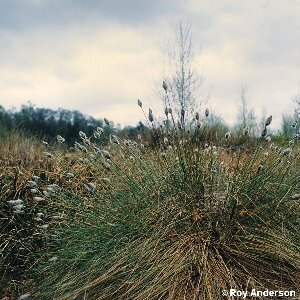 Each shoot produces only one head of flowers/fruit, unlike the common cottongrass (Eriophorum angustifolium) or the much rarer broad-leaved cottongrass (E. latifoium). All names: Eriophorum vaginatum L.; Eriophorum opacum auct. 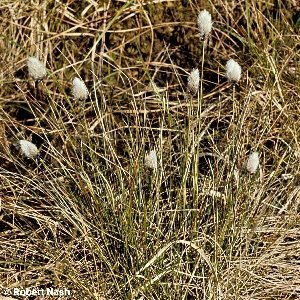 ; Eriophorum brachyantherum auct.